Fatigue is the major issue that businesses and insurance companies face in human resources. It negatively influences healthcare and insurance costs. Thus, business profitability is dropping. It decreases work performance by reducing creativity and concentration. It slows down work productivity by rising sick days. It increases injuries and accidents at the workplace, which means more money spent on workers’ compensation claims. It lowers self-motivation and job satisfaction among employees. Everyone knows what fatigue is. It makes you become less alert and responsive to things around you. Despite this, the tools available to overcome the issue of fatigue are very limited. Nearly everyone is overtired or overworked from time to time. Such instances of temporary fatigue usually have an identifiable cause and a likely remedy, such as a good night’s sleep. Constant exhaustion, on the other hand, lasts longer, is more profound and isn’t relieved by rest. It’s a nearly constant state of weariness that develops over time and reduces your energy, motivation and concentration. Fatigue at this level impacts your emotional and psychological well-being, too. Our main objective is to concentrate on the individual roots of fatigue. By assessing and measuring the personal aspect, our coach has a better overview of the action plan to set up for each customer. By treating the main causes of tiredness, each customer can improve his current status faster and more efficiently. By implementing the accessible action plan, results are sustainable in the long-term. They are beneficial not only for each employee, but also for the employer. What might constant exhaustion mean for my health? A Swiss eats on average 4x more chocolate and 2x more cheese than an American (Swiss Federal Statistics). The average person in Italy eats more than 51 pounds of pasta every year. The average person in North America eats about 15-1/2 pounds of pasta per year (The World Pasta Industry Status Report 2014). France is the second country that consumes the most fast food in the world (Insider Monkey). Canadians consume 173 pounds of fresh and processed potatoes per person while Americans consume 110 pounds in 2011 (PotatoPro). 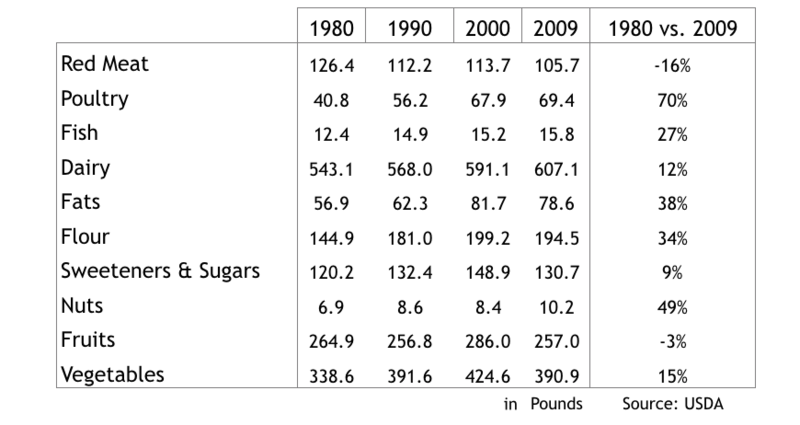 Analyzing the U.S. Department of Agriculture data, we can have a better overview of the Nation’s food consumption trends over the last 30 years. It is estimated that today Americans each week eat an average of 3 hamburgers apiece in 2013 (4 hamburgers apiece in 1969). About 20 billion (15 billion in 1968) hot dogs are consumed per year: this means an average of 70 per person (75 in 1968). Whole milk availability dropped to 5.4 gallons per person in 2012, almost a quarter of 1970’s 25.3 gallons. In addition, lower fat milk availability has leveled off to an average of 14 gallons per person since 1998. U.S. availability of ice cream has declined since its peak of 22.7 pounds in 1946. Despite the multitude of offerings in the ice cream aisle, ice cream availability has fallen to 12.9 pounds per person in 2012, down from 16.7 pounds in 1970. Potatoes chips consumption hasn’t changed since 1970 with 4.3 pounds per person. Over the last 20 years, sales of full-calorie soda in the United States have plummeted by more than 25 percent. Soda consumption, which rocketed from the 1960s through 1990s, is now experiencing a serious and sustained decline (New York Times). It is frustrating that the government has no clue about obesity epidemics. People feel guilty because they try to eat healthier based on health professionals’ recommendations, but they face difficulties achieving long-term results. By analyzing food habits of our customers, we have observed the same phenomenon. 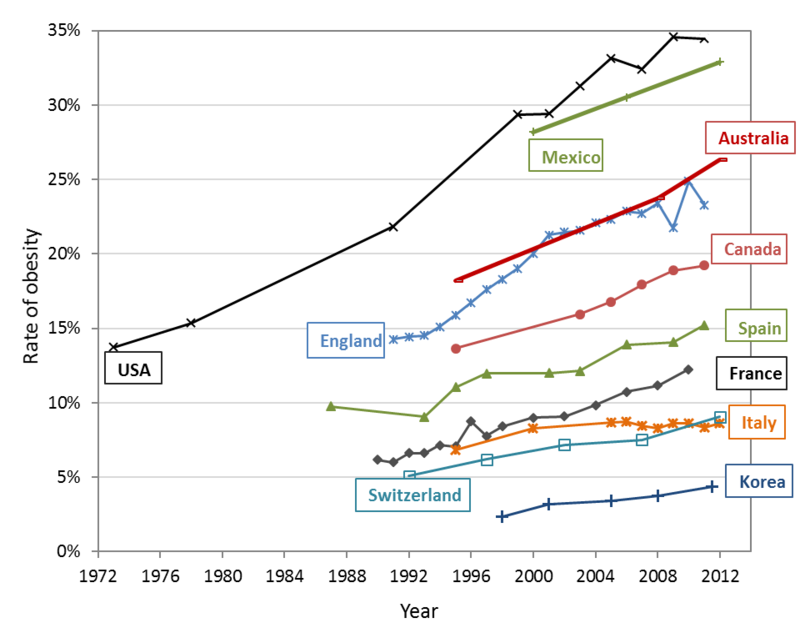 People have the tendency to eat healthier and exercise more than our European customers. Why is there this huge difference? Metabolism is slowing down due to various habits, even those considered as healthy. Dehydration level is higher in America than in Europe. 75% of Americans are functioning in a chronic state of dehydration. Current popular diets have been invented in the 1970s, when obesity was low and evident (too much food consumption, sedentary lifestyle). This is the reason why they are not adapted to the new types of obesity in the 2010s. We process a full analysis for each customer in order to see which missteps are the main sources of overweight issues. We settle a personalized program based on the lifestyle, personality, stress level, food habits, and health goals based on 90 parameters. We have designed 60 different profiles to fulfill our customers’ needs. A minor modification of eating habits will lead to a body composition change (body fat/body muscle mass). By stopping the overconsumption of such or such food, your body will cease storing it. Better yet, your body will instinctively self-correct the excess of body fat by destocking what it has accumulated. The question is controversial, because most people think that they don’t exercise sufficiently. Our popular culture believes that increased physical activity can either prevent obesity or bring about weight loss. An Oregon State study showed that less than 3% of U.S. adults live a healthy lifestyle. The study looked at 4,745 people from the National Health and Nutrition Examination Survey. The researchers analyzed if adults were successful in four areas that fit typical advice for a “healthy lifestyle”– moderate exercise, a good diet, not smoking and having a recommended body fat percentage. Fulfilling those characteristics reflects a lower risk of cardiovascular disease, cancer, type 2 diabetes and other health problems. Out of the study group, 2.7 percent had all four characteristics, researchers found. About 16 percent had three, 37 percent had two, 34 percent had one and 11 percent had none. 46 percent were sufficiently active (150 minutes per week). Having 5 times more people having a physical activity than people having a normal body fat means that exercise alone is of modest help in weight loss. How can this be? The answer is simple: weight loss is a different process from maintaining weight. The idea that people are overweight because they are not exercising enough is disproved by data. In July 2013, the Institute for Health Metrics and Evaluation released a policy report “The State of US Health: Innovations, Insights, and Recommendations from the Global Burden of Disease Study” at a White House event. The research found, “as physical activity increased between 2001 and 2009, so did the percentage of the population considered overweight”. Other studies go on to show that overweight people do about the same amount of physical activity as lean people. Meanwhile, obesity may lead to inactivity, not the other way around. In fact, it is interesting to compare the belief that less exercising causes overweight to the belief that partying less causes aging. People party less when they become older. They don’t get older because they party less. The same holds true with exercise and obesity. Metabolism adapts to high-intensive and resistant physical activity. If duration and intensity are too high, it may stress out your body and slow down your metabolism. Your goal for weight management should be to slightly increase the total number of calories you burn each day. Do it gradually, especially if you have been quite sedentary. We take adaptive thermogenesis into account to set up each personalized program. Adaptive thermogenesis is the terminology that describes how your body responds to calorie restriction. Your body’s goal is to maintain an environment where it has enough energy to do the many energy-requiring tasks it needs to do (body temperature, heart rate…). It reacts to changes in energy balance by speeding up your metabolism (when you eat too much) or by slowing things down when you don’t consume enough energy. Adaptive thermogenesis refers to a slowing of metabolism that is greater than expected based on your lean body mass. When you lose weight, you generally lose muscle. This reduces your energy needs and your metabolism slows slightly. Adaptive thermogenesis is a slowdown in metabolism that’s independent of muscle loss. How can I beat stress at work? 83% of Americans are stressed at work. Unreasonable workload, poor compensation, and frustration with co-workers and commutes are cited as some of their top stressors (Harris Interactive, Stress Survey). Stress is the repetition of negative emotions which prompt a feeling of helplessness. The body tries to defend itself by resisting and adapting, and finally gets exhausted. Negative emotions are a part of life and are even necessary for survival. The fear we feel protects us from danger. The shame we feel keeps us from being obnoxious or offensive. The sadness we feel provokes others to console us. The disgust we feel keeps us from gorging ourselves on mustard. Stress and depression are two sides of a same obstacle in your path: an unresolved accumulation of negative emotions over which you feel like you have no control. Depression is then the result of this last phase, the final phase of resistance against stress. Don’t let negative emotions turn into negative feelings and stress. Emotion comes on suddenly. You feel it. You manage and control it through coherence so it doesn’t become either stress or resentment. Under stress, your body produces way too much cortisol. This hormone degrades your memory, shrinks your ability to generate creative options, and makes you feel like success is out of your control. The goal is to prepare for future situations and to develop procedures to better adapt our reactions so that life becomes more pleasant and comfortable. Our stress-reduction techniques help to decrease stress levels. 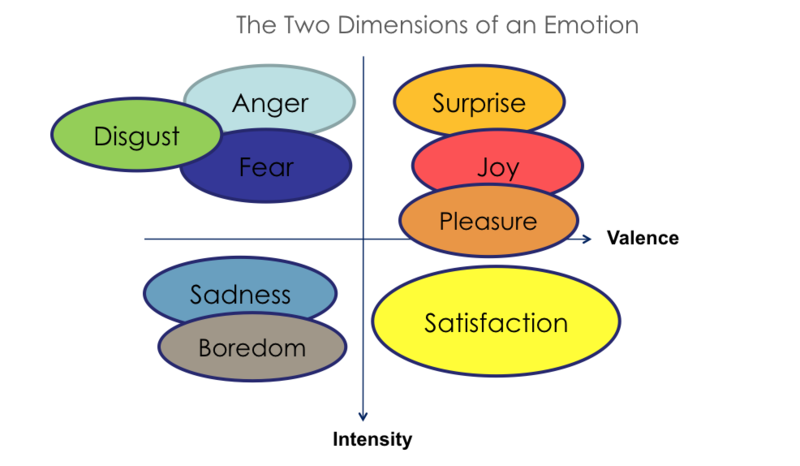 The goal is to avoid the accumulation of negative emotions and feelings at the end of the day. Therefore, you wake up in the morning with a lower stress level. Decreasing the sensitivity to stress is crucial for any successful stress management program. Our coaches can assess how intensely you feel stress. Recognizing the stressors allows you to be more objective in order to face up to them. Understanding how the mind works, the drivers of subjectivity, and a minimum knowledge of mental models can help dispel notions of fear and insecurity. How can I rejuvenate my sleep quality? Deep sleep is the constructive phase of sleep for recuperation of the mind-body system in which it rebuilds itself after each day. Also growth hormones are secreted to facilitate the healing of muscles as well as repairing damage to any tissues. During deep sleep, all energy goes into recharging your batteries. Your kidneys clean your blood, old cells are replaced, wounds heal more rapidly, lean muscle tissue builds up. REM is a paradoxical phase. The name stands for Rapid Eye Movement: our brain is active and our eyes are too. REM sleep is packed with mental benefits; it optimizes concentration, improves decision making, consolidates memories and organizes learnings. Plus, REM is the stage of sleep in which we dream. Light sleep is the term for sleep that falls into the categories stage 1 and stage 2. It’s a Non-REM form of sleep and differs from heavy (deep) sleep of stage 3. Stage 1 makes up a small fraction of total sleep time (about 3%) and is mainly a transition between waking and Stage 2. Almost all light sleep is stage 2 sleep. Some bodily phenomena are more like waking in light sleep than they are in deep or REM sleep. You move more in this stage. If someone is talking while asleep, it is most likely in light sleep. Heart rate and respiratory rate are lower than in waking and the body regulates temperature as it does during waking. Deep and REM are the most important elements of sleep that renew and revive our body and brain. Having sufficient Deep and REM per night is critical. To have a good sleep , you need 3-4 hours of Deep sleep and REM and the balance would be light sleep. Stress and nutrition are 80% responsible for good or bad sleep quality. The 120 minutes before bed are crucial for improving sleep. It will allow you to calmly prepare for a night of sleep, devoted to peacefully recharging all physiological and emotional batteries. By improving Deep Sleep and REM, you will feel more creative, more task-oriented, and concentrated at work. With wearable devices, it is now possible to measure and analyze both sleep stages. Practicing specific relaxation techniques before bed is a great way to calm the mind, wind down, and prepare for sleep, such as breathing exercise, visualization, and progressive muscle relaxation. How can you boost our current corporate wellness program? We are complementary because we have different goals. RESO programs medically treat the causes of obesity/overweight and the harmful effects of stress. Wellness programs objectives are mainly to prevent stress, overweight, and sleep deprivation, to promote smoke-cessation, and to improve well-being, physical activity, and job performance. RESO Programs promotes physical activity. Nowadays, Americans do more intentional “exercise” than people anywhere else in the world. 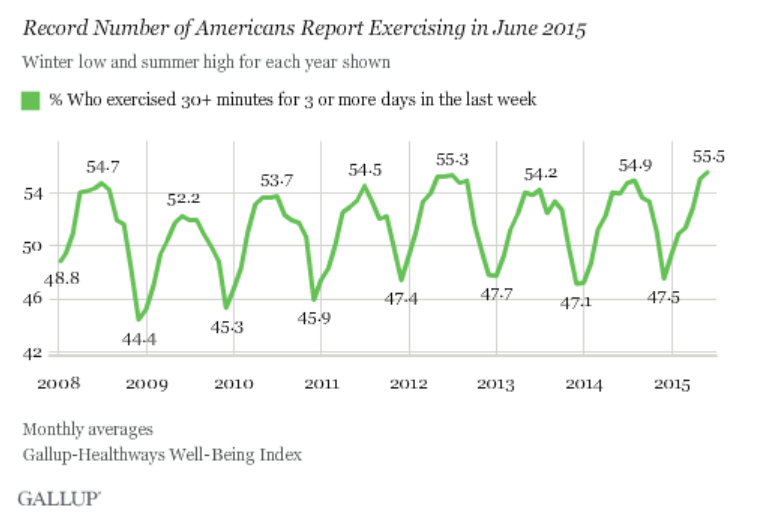 Americans are voluntarily exercising more than ever. Other studies confirm that obese people do about the same amount of physical activity as lean people. Unfortunately, exercise alone has low impact on weight loss because of metabolism adaptation. The only “weight versus activity” relationship that has been proved is that obesity may lead to inactivity. More body fat may lead to less exercise, not the opposite. People may exercise less because they are overweight. They do not become obese because they are exercising less. With obesity come deep metabolic changes that make exercising harder. Also, common sense tells us that if exercising less is the cause of our collective weight issues, we must be collectively exercising less. As shown, this is the reverse. 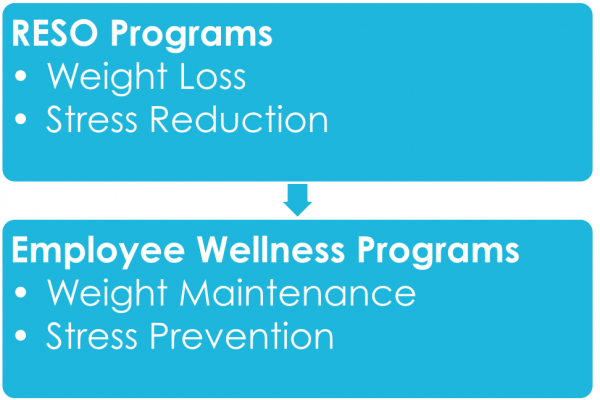 By starting RESO programs, employees lose weight. As a result, they are more likely to take advantage of available physical activities offered in their corporate wellness programs with more health benefits. As a medical group, all data we collect are considered part of the medical record. Employee privacy is protected. Our standards fit all new regulations of the Affordable Care Act. Employees can use their FSA (Flexible Spending Account), their HSA (Health Spending Account), and their HRA (Health Reimbursement Account) for any co-payments. RESO believes that by helping employees improve their health, small and medium sized companies can enhance efficiency and effectiveness of its workforce while significantly reducing the company's healthcare costs. RESO Corporation is a medical group of health coaches and licensed dieticians covered by health plans and Medicare. RESO improves employee health, productivity and happiness while reducing your insurance cost, with the goal (or added benefit) of preventing injuries and illnesses at the workplace.